Joshua post some picture to see what the slate looks like. Nick, Joe told you what you need to know. You should be able to get how ever did the work to fix it. If not you can call me again and we can talk. 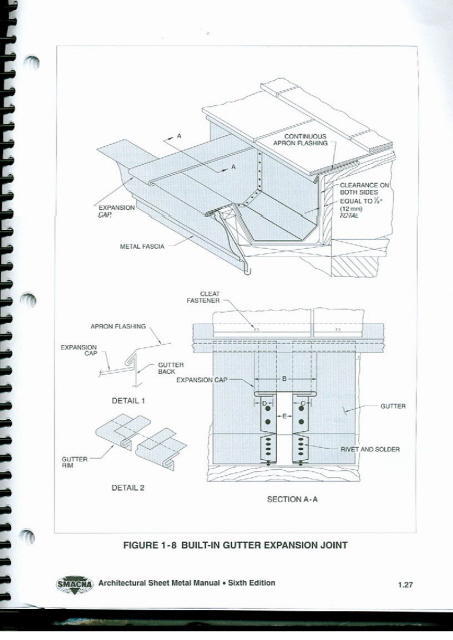 The rule is an expansion joint every 30' (approximately). In your case, you had a 30' section, but it was boxed in at both ends, allowing for no expansion. So you would have had to terminate the ends to allow for expansion. Plus, you should use cleats, drip edges that you can clamp over, and rivet every inch before soldering. If you had done these things, you probably would not be having a problem today. I am looking to purchase an old tudor in Montclair NJ. The slate roof looks like it needs some work according to a contractor. It is close to 85 yrs old. 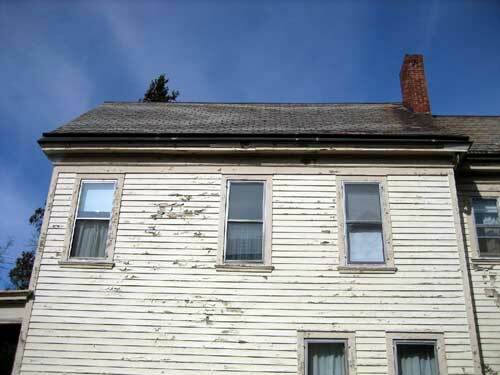 I was wondering if I can send some pics to anybody who has experience looking at slate roofs. The question is really "take it all down and replace it w Slateline Asphalt or spend the money over time to fix it?" Thank you - send me your email address for pics. Responding first to Joe's message, since the roofer installed the rivets on the second return visit, rivets were not installed before soldering. I think a 1.5" overlap is achieved, but I suspect it may be a little shy. To answer your question, no the copper sections are not cleated, they are nailed. Finally, you indicate an expansion joint is needed every 30', but do you mean to say if you have a single run of 30', then you would need an expansion joint to split it (15' and 15')? This is important as I measured my run and it is 30' exactly (See Figure 1 and Figure 2 below) with three seams each of which has split every winter since installed. The pictures are as follows: Figure 1 and Figure 2 are full shots of the troubled section. There are three major seams; from left to right I show in Figure 3 the left most seam (worst condition - complete failure), Figure 4a the middle seam ( partial failure - crack at bottom of water channel), and Figure 4b middle seam, crack over clad 2x4. Figure 5 shows the overlap seam technique used. Finally Figure 6 is a schematic of the roof section. When riveting sections together, a rivet every inch is recommended along the entire seam, prior to soldering, with a 1.5" overlap if a flat lap. Expansion joints are recommended every 30'. 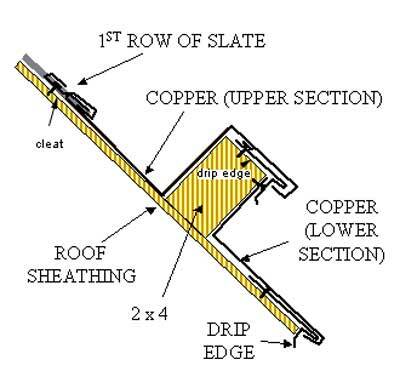 Are the copper sections cleated to the roof or nailed? There should probably be a separate drip edge nailed to the roof under the lower section so the lower section can have something to clamp to along the bottom. I have attached a revision of the drawing showing a possible alternative scenario where two extra drip edges are installed, nailed to the wood, to allow for the metal to clamp over the edges thereby enhancing expansion and contraction and taking the strain off the solder joints. Also, it shows a cleat system along the top edge of the upper section, also needed to take the strain off the solder joints. For gutter see attached pic. Thanks for the response. I will get a picture of one of the problematic seams this coming weekend and post it. If I may ask, what is the difference between a lock seam and an expansion joint? Yes, this profile should have been locked. It just take some time, on site. There may need to be a expansion joint for the movement that you have indicated. For more info on sheet metal movement www.smacna.org. I have installed the same type of system and have had no problems. Is there any pictures of the solder seams? BACKGROUND: I bought at 1910 Victorian just outside Albany, NY five years ago that had its original slate roof and Philadelphia gutter system (essentially a 2x4 system built on top of the roof surface). The slate was (and still is) fine, but the gutters were in dismal condition so we opted to have them rebuilt; they were some kind of tin and we replace them with 20oz copper. They were repaired in the Spring time, and in the following winter nearly all the seams split. I had the roofer come back the following Spring and he re-soldered. Many of the same seams split the following winter. I had him come back again and he riveted the seams and re-soldered. The seams are still splitting! MY INVESTIGATION: The seams that are splitting are cases where two long (eg. 8 feet) sheets of copper meet. 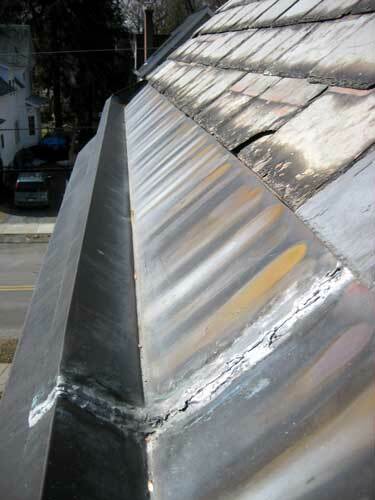 Also, I discovered that the roofer used the simple overlap and soldered seam technique. 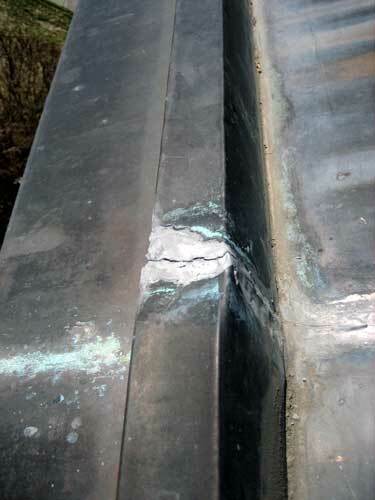 By the properties of copper, an 8 foot section will move an 8th of an inch for 100 degree F change. So two sections meeting can separate by approximately 1/4 inch! 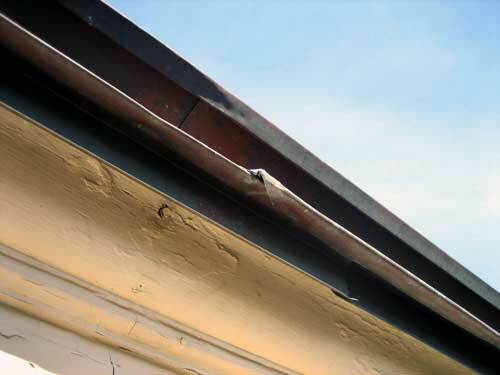 MY QUESTION: Is there a way to use a locking seam technique (like the one SpencerP mentions in a previous 2004 thread on this site) on a Philadelphia gutter system? 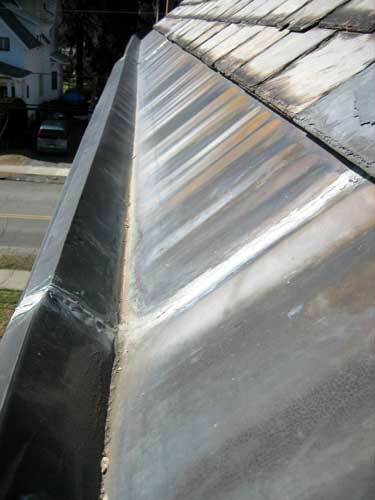 Specifically, the profile of this gutter is shown in the attached figure. 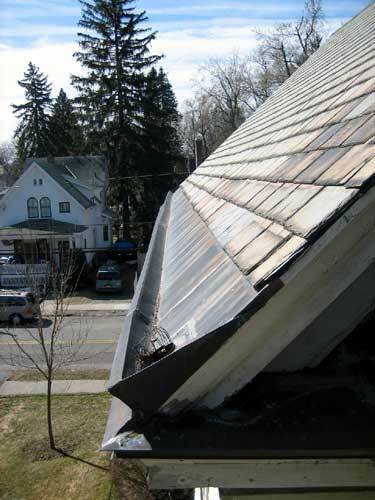 The roofer used a two-part system as shown. I don't know much about bending metal using a break, so I'm just not sure if a locking seam can be formed across a profile with right angles - see figure. Also, what is the (max?) recommended length for each section of copper to be joined with a locking seam?